The best price is for Novastar N9 + C1. They are sold as a set, not separately. 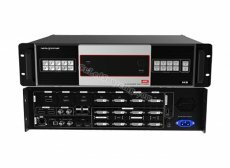  Up to 9 inputs, including 1 × dual-link DP 1.1 (can be replaced by HDMI 1.4, DP 1.1 or dual-link DVI), 2 × HDMI 1.3 (can be replaced by DVI/VGA/CVBS), 4 × DVI,1 × DP 1.2 and 1 × 3G-SDI.  Up to 7 layers supported at the same time. Max. resolution of each layer:3840×2160, 7680×1080 or 1920×4320.  Customized BKG settings You can load an image file from the control computer or capture an input source image displayed on the screen as the BKG image.  EDID management supported Supports custom EDID and standard EDID.  Output resolution settable. The mosaic width of 4 outputs can be up to 15360x600.  Layer position and size adjustable Layers can be added with borders of custom widths and colors.  32 presets A total of 32 users presets can be created and saved as templates which can be used directly and conveniently.  Intuitive color LCD screen and clear button indicator prompt on the front panel, simplifying system control and operation.  Genlock synchronization and synchronization with any input source supported, achieving output vertical synchronization.